The statement in their financial presentation needs to be read several times, because it is a doozy of an admission: "Reconsider product planning of Nikon 1. Nikon 1 represents the majority of sales volume reduction of 550,000 [units in] interchangeable-lens type digital cameras." Make lower end products (e.g. S1, 11-27.5mm), but keep DSLR-level prices. Reduce parts count by an order of magnitude, but charge same price as DSLRs. Make high end lenses (18.5mm f/1.8, 32mm f/1.2). Make a high end camera that costs almost as much as a D7100, but leave off high end features. Talk about marketing to women, but not really doing it. Improve the FT1 autofocus but don't really market it (e.g. just update the Web site downloads and hope people notice). Fire sale price zips the cameras out of the store (well, maybe not the J1), but regular price has them sitting on shelves. All these things add up to "no one in charge." We've got at least six Nikon 1s here at my current workshop in Africa. I'll have a lot more to say about how that worked out in September. There's a reason for that many Nikon 1's showing up, and it's part of the split personality problem that shows up virtually everywhere in the Nikon 1 world. I imagine by the end of this trip we Nikon 1 users could put together a better story for the Nikon 1 than Nikon has. Unfortunately, even if we can, we can't fix the price and design problems. It simply is unclear what Nikon thought they were doing when creating the Nikon 1. From a technology standpoint, it's a tour de force. The first (and still the best two years later) non-DSLR focus system. The ability to shoot 60fps at 14mp. Some high-end lenses that are quite good. The ability to use DSLR lenses and lose only one small bit of functionality (multiple-point AF). As noted above, a manufacturing breakthrough that reduces the number of parts in the camera by an order of magnitude over a DSLR. From a marketing and positioning standpoint, the Nikon 1 is a complete failure. First, the camera pricing was ridiculous. Taking needed shooting controls out of the high-end model, also ridiculous. No real sharing of accessories with the main Nikon lineup, again ridiculous. Mostly expensive, high-specification lenses for a line that's had four out of six cameras entry level, strange. I happen to know a couple of the engineers that worked on the Nikon 1. They're top notch. You can almost tell what parts of the camera they worked on ;~). The real problem Nikon is facing with the 1 is something different, though. It's all about decision making and clarity of purpose. There isn't any clarity, and the decisions are all over the place. So to find that Nikon is now having an existential, soul-searching debate about the Nikon 1 isn't surprising. They are exactly in the place they put themselves. They should have had the "reconsider product planning" debate three years ago. But it really is more problematic than that. The J1 is still around and selling for US$400 for the two-lens kit, brand new. That has to be the best <US$500 compact camera available (though the fire sale on EOS M gives it a run for the money). Got a compact camera budget but a DSLR-like quality fetish? Get a J1 while they're still available. Have we heard Nikon say that? Of course not. Because Nikon sells 24 different compact cameras and 12 different DSLRs right now. If you've got a compact budget, Nikon wants to sell you a compact. If you have a DSLR quality fetish, they want to sell you a DSLR. Strangely enough, Nikon has done everything they can to not sell you a Nikon 1 and now are perplexed as to why you won't buy one. As I've pointed out before, mirrorless as originally defined by Panasonic and Olympus was trying to wedge into a space between compacts and DSLRs. 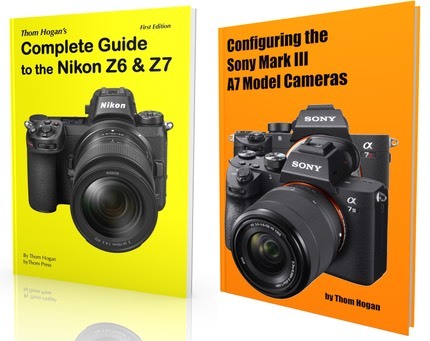 Compacts have always gone right up over the US$500 mark, and last generation DSLRs always sell from about that point, meaning that there is no price gap between the two. What there is is a quality/price balance that might work. DSLR quality at high-end compact price. All those fire sales of old inventory have proven that over and over again. Surveying my site customers, I find that most of the mirrorless buyers in my audience bought initially on discount, not at full price on release. That's savvy on their part. Smarter than the camera companies. Rationalize pricing. $550 for a J3 with the kit lens is not rationalized. That's the same price as a D3200. Basically you're selling small against better. Which do you think wins? Emphasize shooting control. A Nikon 1 has to sit at the top of the compact line, which means "bigger sensor, more performance, more control" than the best compact. Understand what it's being used for. I don't mean walk around Tokyo and ask the women you see with a Nikon 1 how they like it. You did make some sales in the US and Europe, Nikon. Do you even know why you made those sales? Or what those users want fixed? Or how you could get more of them? I'm really surprised that Nikon never hired a pro to prove a point. I'm make you a wager that virtually all of the shots you've seen me publish could have been done with a Nikon 1 and you wouldn't have noticed (we'll have a good example of that when I post my Botswana workshop daily blog in September; see how many photos you think were taken with a Nikon 1 versus a Nikon D800 ;~). The big marketing problem Nikon had with the Nikon 1 was simple: 1" sensor. The way you get around the fact that you've got a smaller sensor is to prove that it doesn't matter. That means lots of big, impressive, well done images. Lots. I don't understand, for example, why every sports shooter doesn't have a V2 in their bag. 60 fps and silent, folks. Want to capture Tiger's swing? The full over-the-bar sequence of a high jump? The exact moment the football was fumbled? The moment the ball comes off the bat? There's a camera that can do all that. It's called a Nikon 1. Sure, it's a situational camera with a few nuances you need to adjust too, but it's a tool every pro should have. Nikon should have given a free camera, lens set, and adapter to a wide range of working pros and begged for some over-the-top shot results. Some folk seem to get all worked up when I point out product management and marketing mistakes. But here we have a company who seems confused, needs to rethink something, and would benefit from a few pragmatic remarks.